Boaties heading out into the Hauraki Gulf over the summer need to take greater care in sharing the water, Massey researchers say, as they uncover the impact of collisions between vessels and marine mammals in the area. In a new paper published this month in the New Zealand Journal of Marine and Freshwater Research, the impact of a boat propeller injury on a bottlenose dolphin was reported, with dismaying results. Coastal-Marine Research Group (C-MRG) PhD student Sarah Dwyer was lead researcher for the recently published paper describing severe propeller strike injuries sustained by an immature bottlenose dolphin (Tursiops truncatus). "In this instance, the bottlenose dolphin sustained injuries that penetrated to the bone. Considering the severity of the wounds, it was surprising that these injuries weren't immediately fatal," says Ms Dwyer. 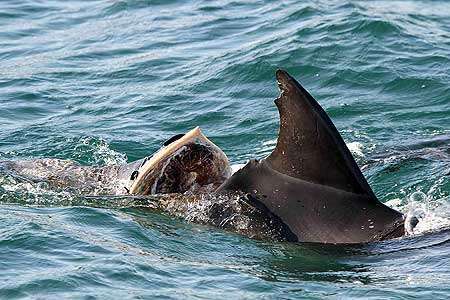 The injured dolphin was identified as a calf when first sighted in May 2010, based on its size and associated swimming position with an adult bottlenose dolphin presumed to be its mother. The pair were always photographed together for the next two and a half years, until the mother was seen without her offspring a number of months after the injured dolphin was last sighted. Post injury, the young bottlenose dolphin was observed with a very large open wound behind its dorsal fin and two more evenly spaced parallel wounds on the tail that were consistent with propeller strike injuries. Over the next 23 days, the wounds changed significantly, with increased soft tissue deterioration. The last reported sighting, in the shallow bays of Great Barrier Island, was on October 21, 2012. It is highly unlikely the mother would have abandoned her injured offspring if it was still alive, therefore it is assumed that the injured dolphin did not survive even though a carcass was not recovered. Bottlenose dolphins are particularly susceptible to human impacts because they are a coastal species, but Director of the Coastal-Marine Research Group Dr Karen Stockin says that the probability of vessels striking marine mammals decreases when speed is reduced. "When the injured bottlenose dolphin was observed, it was towards the end of winter, when boat traffic is traditionally low. Risks to marine mammals increase as the number of vessels out on the water rises, so we need boaties to be acutely aware that they're sharing the waters with other marine mammals, and, more importantly, to immediately report any incidents of vessel strike," Dr Stockin says. "Part of our research at the Coastal-Marine Research Group involves performing necropsies on dead mammals to ascertain the cause of death. Some die as the result of blunt force trauma where a vessel has hit a dolphin or a whale hard enough to kill it. We also observe dolphins and other marine mammals with wounds or scars from propeller strikes – some of which they can recover from, and others that later die from their injuries." The Hauraki Gulf is home to one of the busiest ports and shipping lanes in New Zealand, with a marked increase in traffic during weekends, with sail boats, personal watercraft (including jet-skis) and recreational fishing boats. It's also shared with a wide range of marine mammals, including a number of different species of dolphins and whales using the waters to feed and nurse their young. It's difficult to work out how many marine mammals are killed or injured by vessel collision or propeller strike, mainly due to the lack of reporting when collisions occur as well as difficulties in recovering fatally-struck animals. Marine mammals in New Zealand are legally protected under the Marine Mammal Protection Act (1978)—anyone who accidentally kills or injures a marine mammal is required to report the incident to a fishery officer or the Department of Conservation within 48 hours. The Marine Mammal Protection Regulations (1992) covers commercial whale and dolphin watching activities, and incidental recreational interaction. Under these regulations vessels must avoid rapid changes in both speed and direction and not exceed speeds faster than the slowest mammal within a vicinity of 300 metres. Vessels travelling at speeds over 15 knots are more likely to kill a whale or dolphin if they hit it, and can still cause severe damage if travelling over five knots (or no wake speed). The popular and highly manoeuvrable jet-ski has quieter underwater acoustics than normal boats. This makes them even harder for marine mammals to detect and avoid, as highlighted in a recent 2013 publication by Dr Stockin and C-MRG research associate Dr Emmanuelle Martinez, who reported the case of a common dolphin that died in the Hauraki Gulf as a result of blunt force trauma caused by a jet ski incident. Recent C-MRG research aligns with previous studies that suggest most of the dolphins hit by vessels are either young calves or juveniles, or mothers with their young. "There are several reasons why this occurs. Younger animals are slower swimmers, with limited diving capabilities. They spend more time at the surface and in shallower waters. They're also naturally inquisitive and less cautious about vessels, so they lack awareness of danger until it's too late," says Dr Stockin. "We need people in all kinds of vessels – from commercial ships to motorboats, yachts, jet-skis and kayaks – to be considerate of other species sharing the waterways. The problem is far larger than just container ships hitting whales, yet most people seem oblivious to this." The dolphins should know the dangers by now. These ones were probably teenage males.